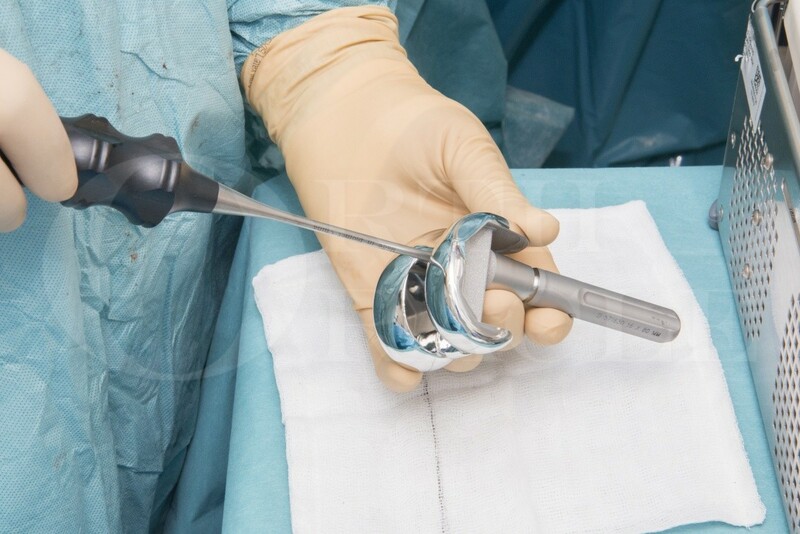 Learn the Vanguard 360 total Knee replacement (Zimmer) surgical technique with step by step instructions on OrthOracle. Our e-learning platform contains high resolution images and a certified CME of the Vanguard 360 total Knee replacement (Zimmer) surgical procedure. Knee replacements are an extremely successful and common operation with over 70,000 performed in the UK each year. With an ageing population people may need a more complex type of knee replacement. The usual reasons for this are major bone loss due to arthritis or fracture, deformity of the knee or weakness of the collateral knee ligaments. The decision of when to use a standard knee replacement, a semi-constrained or fully contained hinged prosthesis can often be a difficult one and can be made at the time of EUA or per-operatively. Forward planning is vital with the complex knee and availability of the required prosthesis. The Zimmer Vanguard 360 is a revision knee system which can also be used in challenging primary knees with significant bone loss or ligament laxity. The Vanguard 360 delivers customisable implant combinations for the complex knee. The prosthesis has a semi-constrained design to compensate for ligament laxity where a hinged prosthesis is not required. The Vanguard 360s’ stems help to distribute the increased load that result from increased implant constraint. The option to add metal augments assist in dealing with bone loss.